You get up every morning, but still, you don’t have that extra time to spare in the mornings? Running late to work, tea time with your ladies, or dinner date with your other half, but still clueless on what to do with your hair? That is why having chic go-to speedy 5 minutes hair styles is important! Forget complicated braids, fishtails, and 25-step chignons. These hairstyles are the ones you actually have time for. Here are just a few ideas to keep you looking trendy and put together when you are on a time crunch. Try these quick, classy styles to get you from you bad bedhead to a beautiful classy and romantic lady. There is a solution for every problem, right? So it wouldn’t hurt to just try it, maybe it will look good on you. Get your curls ready for work with these easy and super quick tutorial. Put your hair in a ponytail, make curls with your heat iron, and just release. Simply as that, you can always get that salon lasting quality curls at home. First, tease your hair with your regular brush i order to make a volume. Once you’re done with all that teasing, move all the hair back to the one side. After, by only helping with your hands, you can try to do the 4th step. 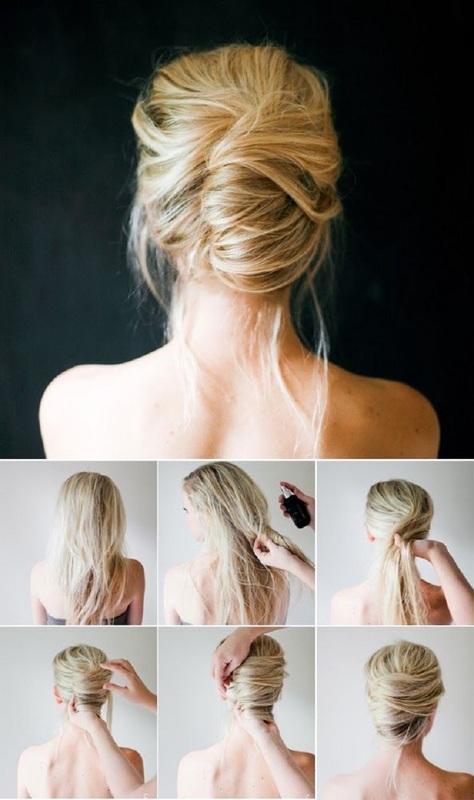 This simple hairstyle is elegant enough for a meeting at work, lunch with your girls, or dinner with your other half! Talking about elegant? This super easy hair style will look just perfect on every outfit that you have picked up, from your simple T-shirt, your work suit, or your elegant dress. 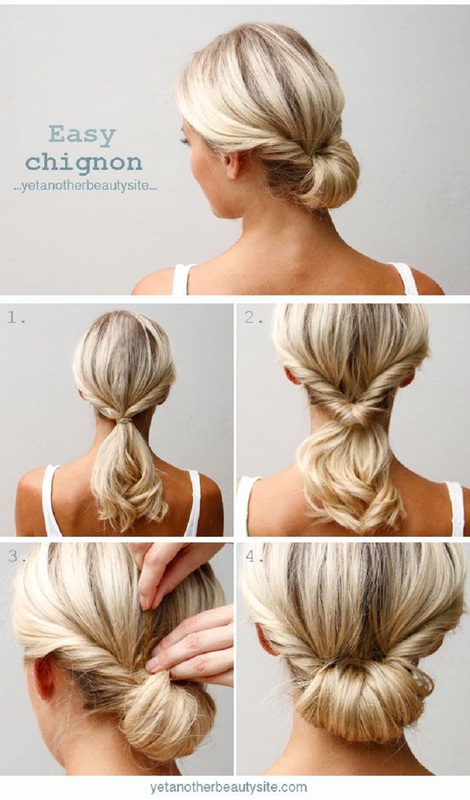 Put your hair in a ponytail as in the first picture, make bun and secure it with bobby pins in order to get that perfect hair look. Who doesn’t love big messy buns and top knots as much as the next door girl? However, this lower sort has a way of exuding class and sophistication in a slightly more subtle fashion. Again, you should tease your hair with a brush, put it in a ponytail, and after that just try to make bun as in the final picture. We hope that it will work out. In case you couldn’t decide between the low bun or twisted pony, both equally flattering options, we have included a union of the two to make your decision easier. This hair style is just to die for, and it will only takes 5 minutes. Put your entire hair in a ponytail, except to the hair near your face, use thatt hair to do the final touch on picture 6. Boring and limp or bushy and out of control. Though the ponytail is a go-to solution for a bad hair day and a morning short on time, simply wrapping a hair-tie around that mess usually does little to mask the hairy situation you’re dealing with. Simply as it looks, first curl your hair, divide it in two ponytails, and you will get this amazing look. You don’t have much time to do you hair perfectly, just every day? But you still want to look good and well put together. This twisted ponytail variation is just the sort of low maintenance styling is the solution. Get loopy by following these easy instructions. Tease a section of hair at the crown of the head and form a mini bouffant by securing it with bobby pins. Then pull the two front sections of the hair around your head, twisting lightly as you go, and secure them both with bobby pins. After, pull another section from under the last one back and around on both sides, twisting them as you did before. This whole half up/half down look is casual and messy, to classy and formal. Perfectly paired with a summer wedding, dinner party, or romantic date! Who doesn’t love the fast, messy bun? Follow these instructions and you will get this look. This particular is a perfect combination of both messy and well put together . Just, perfectly balanced for day at the office followed by dinner and drinks! How adorable is this? Sweet and also romantic, tie this one up and you’ll be ready for an afternoon drinking tea with your ladies. 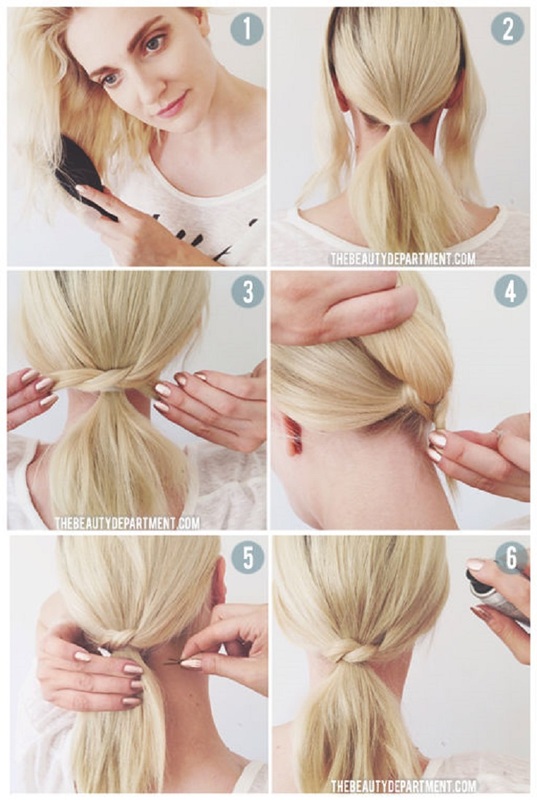 First, you should part your hair to the side, make low pony using a hair tie. After, you should make a hole with your fingers in the centre of your hair, above the hair tie. Flip your braid through the hole. Pull it all the way through, your hair will look twisted on the sides. Roll the bottom of the braid into itself, upward, towards the top hair tie. After you’ve rolled it all the way up, pin it in place with some bobby pins. Is it perfect? Lovely hairstyles! They look so sophisticated. This list is a farce. If you need someone else to help you with the hairstyle (which is evident in those photographs), then it’s not “easy, quick and done right before work!” I don’t have someone just standing around everyone morning ready to help style my hair. Make an actual list where it’s clear that the hairstyles can be done by yourself without the assistance, otherwise this list is just b.s.